Former New York Giants linebacker Quincy Monk (2002-03), who was drafted by the team in the 7th round of the 2002 NFL Draft, has passed away at the age of 36 due to cancer (adenocarcinoma). He leaves behind a wife and two children. TE Larry Donnell (neck), LG Justin Pugh (concussion), and LB Mark Herzlich (quad) did not practice on Wednesday. The situation with Donnell is also sounding more serious. Donnell said on Monday that he was cleared to return to practice. 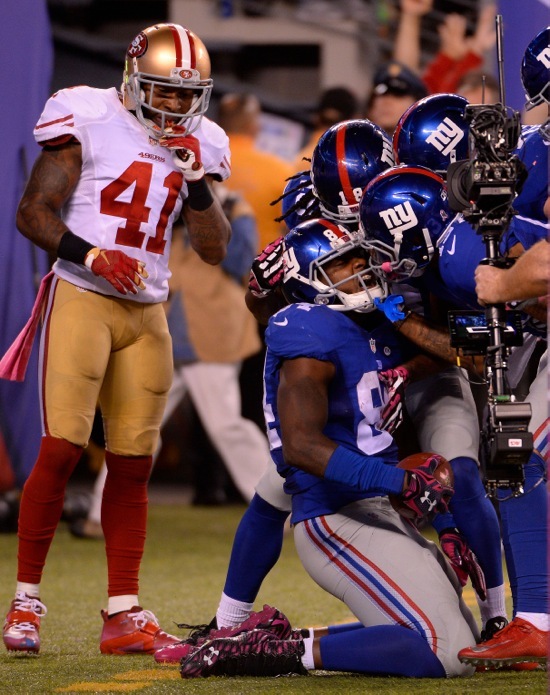 “(Donnell) continues to have the issues,” said Coughlin. OC Weston Richburg (ankle) and LB J.T. Thomas (ankle) practiced on a limited basis. OG Geoff Schwartz (ankle), DE Damontre Moore (hamstring), LB Uani ‘Unga (neck), CB Prince Amukamara (pectoral), and CB Leon McFadden (groin) fully practiced. The Giants practice on Thursday and hold physical recovery cycles on Friday in advance of Sunday’s away game against the Washington Redskins. I finished up the interviews with a couple of rookie prospects, one on defense, Quincy Monk, linebacker, who I will refer to as Q, and the other on offense, free agent, tall, wide receiver David Thompson. The guys were sitting around the locker room, in various positions, some studying the plays, others just chilling for a couple of minutes before the next round of meetings. One hopeful was actually sitting in his locker, recessed so deep you had to look to find him, meditating on his chances. Several were just sitting on their stools catching their breath. Q was lying on the rug, relaxed, talking and joking with several colleagues. DT was chattering at him, all the while looking at his play book. I got down on a knee to talk to Q. He is an intriguing prospect. Almost overlooked by everybody although he had outstanding production, relaxed as if he were a veteran, comfortable with himself. I started by asking him why he was overlooked and he laughed and said that he would also like to know why. I went on and asked him about his experiences now that he was in his second camp. Q: It’s fun. It’s just a learning process; it’s not the game. It’s so much faster…part of getting adjusted to the NFL. Q: It’s been cool, playing with the veterans, people like Strahan and Barrow and all those guys. It’s just a pleasure, because, you know, this is like a kid’s dream to be in the NFL. But, Q is not just a golly gee guy. He is acting as if he belongs, with a quiet confidence that promises good things. I ask him what is the most striking thing to him about what he is seeing. Q: The speed of the game. Everybody has talent here and it’s just recognizing the play fast and just going out there and making plays. As rookies, they throw a lot at us. It is totally different from college so you’ve got to pick it up as fast as you can. As a tight end, I figured he would be a good source about Shockey, so I asked. Q: He’s pretty good; he’s real good. I think he’s going to have a great year because he’s big and strong and fast. Right now they’re working him a lot in starting formations. Q: As a rookie, I’ve got the jitters out of the way, so I’m out there having fun. David Thompson was sitting across from us studying his play book. I asked him if he had talent and he answered that he did. So I walked over, pulled up a stool and began to chat with him I asked him how he stacked up against the legion of wideouts in camp. DT: Personally, when I first got here, just little nervous touch. Now that I’ve been out there a couple of days, I’ve got a chance to see some of the starters, some of the veterans. It felt good to be out there. Amani Toomer’s been a great help to me. He’s giving me some good help, and Ike Hilliard as well. I got a chance to see them work out and I feel pretty good. I feel like I’m doing pretty good; it’s just that sometimes I make a couple of mistakes with the plays. I think that’s the key factor here; it’s just getting all the plays because it comes at you so quick. I think everybody has the talent out there, across the board, as receivers, but it’s just sometimes hard for rookies to get all the plays, that’s the hardest thing for me. Once I get the plays I think my talent’s going to be able to step up and I’ll be able to show myself. We talked a little about the whole deal of coming into a camp like this. I told him that I was a lawyer and about how Billy Taylor came over to talk to me the first year in Albany because I was sitting by myself. BT thought that the regulars weren’t particularly gracious because I was carrying a camera and he told me how he had been less than warmly received by the crew when he first started as a journalist because after all, he was a football player. DT told me he had taken pre-law courses in college and he understood the business of the game. He knew he was an underdog and certainly has a failsafe. He got kind of quiet and then told me that he just wished he knew what the coaches were looking for, what they wanted. I told him a little about Jimmy Robinson and told him not to be afraid to ask. Then he told me how really difficult it was for the free agents because the draft guys, or highly recruited guys were getting multiple reps, but the street guys would get one or two balls and it was so difficult to make an impact under those circumstances. I teased him about his “sneaky” speed, which is obvious when you watch him. DT: Sneaky, yes, that’s deceptive, I like it, you know, it looks like that because I have the long stride; I’m not tapping real quick, I don’t have real quick foot speed so it looks like I’m kind of slow; but I like that; a cornerback has a tendency to sit out, then when you get up on him, it’s too late. So that’s something good. I’ve done it through college. I’ve always had to deal with the CB sitting and waiting and I just run by him, so hopefully that will help me here. I asked him how he liked working with a pro QB. DT: You mean Kerry Collins. He introduced himself to me today. Real nice guy. I haven’t had a chance to sit down and chat with him yet, but he seems like a good guy, helpful. He was helpful on one route when I had to run the route against Will Peterson and I got caught up in the route and he (KC) was telling me some things I could have done to make it a lot better. He has a nice touch (on his passes). I like his touch, and he looks real comfortable back there. I’m just trying to stay on top of these plays. Once these become second nature, I really feel like it’s going to be a great thing out there, a great show. That’s it for the interviews. Young guys, hopeful, pressing, trying to act like they have done it before and like they belong here. There is a lot of pressure at this level. The brass ring offers great rewards, but for many of those who don’t make it, there is a tough adjustment. This is a pretty relaxed group of young men, as far as football hopefuls go. There is some bona fide talent walking through this locker room. The odds favor the seven draftees. The rest need a break. Next week, final analysis of this mini-camp.